During the week leading up to the 2014 OSP, the forecast was for benign weather. And that's how it turned out. I can't say that sky conditions were really pristine, but all of the four nights that I spent there featured a good chunk of clear sky. Daytime temperatures were refreshingly comfortable, and although Thursday and Friday mornings were a bit chilly I never needed to break out the gloves. I arrived at about 2pm on Wednesday. Skies were mostly to partly cloudy with cumulus that looked like it would retreat by nightfall. And it did. I'm not one for pins and certificates, but I did find Howard Banich's Level 3 observing list interesting. 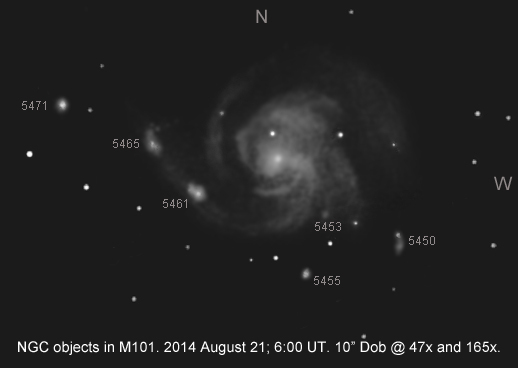 I'd never really plumbed the depths of M101 or M33, so I figured I would do that this year and maybe make some detailed sketches as well. This was just a decent, clear night. Limiting magnitude in Lyra around midnight was right at 7.0. Seeing was average. 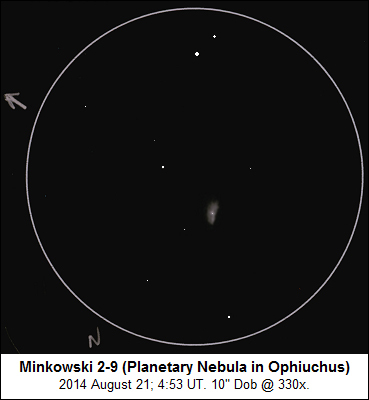 My first list object was Minkowski 2-9, Minkowski's Butterfly. I starhopped to this dim, elongated planetary nebula from Eta Ophiuchi and HD 155078. At 165x, the nebula is visible as a faint patch elongated N-S with a stellar center. A star fainter than the nebula is just to the NW, and a star a bit brighter than the nebula about twice as far to the SW. Nebula is quite small. At 330x, the nebula is enlarged, but I don't see much additional detail. Center remains stellar. There are hints of brighter spines in each lobe. NGC 5471: Bright, very condensed spot. Forms NE corner of a keystone with 3 field stars, well to the E of the main body of the galaxy. Essentially stellar at 47x. At 165x, shows a stellar center surrounded by a small amount of fuzz. At times, appears cometary, with a slight elongation to the SSE. NGC 5462: Almost midway between 5471 and the galaxy's nucleus. Occurs near the end of a spiral arm. Well-differentiated from the arm. Elongated 2:1 NE-SW, and almost appears double. At 165x, shows a mottled texture but without much of a bright center. NGC 5461: The most obvious knot in the spiral arms. Sits SE of the nucleus and SW of 5462 along the same arm. A bit smaller than 5462, but larger than 5471. At 165x, appears elongated NE-SW with a bright center and a bright spot on the E edge. NGC 5450: Sits just S of a field star. A rather diffuse, hazy patch, elongated N-S. Northern component NGC 5447 doesn't stand out as a separate lobe or condensation. NGC 5455: Readily visible. At low power or with a casual glance, looks like a star that wasn't plotted on the map. At 165x, appears as a round nebulous spot that makes an isosceles triangle with a couple of prominent field stars. NGC 5453: Just a hazy spot, slightly nebulous, without detail. The ones I didn't note: 1) NGC 5447, which appeared merged with 5450; 2) NGC 5458, which didn't stand out from its spiral arm; 3) NGC 5451, which I suspected but wasn't sure about; and 4) NGC 5449, which I just didn't see. I planned to come back on another evening, but didn't get around to it. 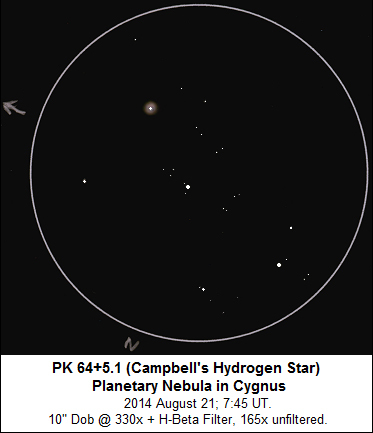 I observed Campbell's Hydrogen Star. Previously, I had noted this little planetary nebula with the bright central star as strongly responsive to the H-Beta filter. At low power, it appears as the end star of an arc of 3 stars of similar brightness. An Orion UltraBlock filter makes Campbell's stand out, and with the H-Beta filter it appears much brighter than the other two stars. At 165x without a filter, the central star is surrounded by a very tight, orangish ring with sharp edges. The color is also visible at 190x and 208x. At higher powers, the ring looks more prominent but the color fades to yellowish or pale. At lower magnifications, the ring and star blend together. Seeing variations also smear the star and the ring together into an orangish disc. No detail is visible in the ring--it's just round or slightly squashed. At higher magnifications with the H-Beta filter, the ring's edges look a bit more diffuse. The nebula sits in an extremely rich star field, but the H-Beta filter kills most of the faint stars and makes it easier to sketch the field. 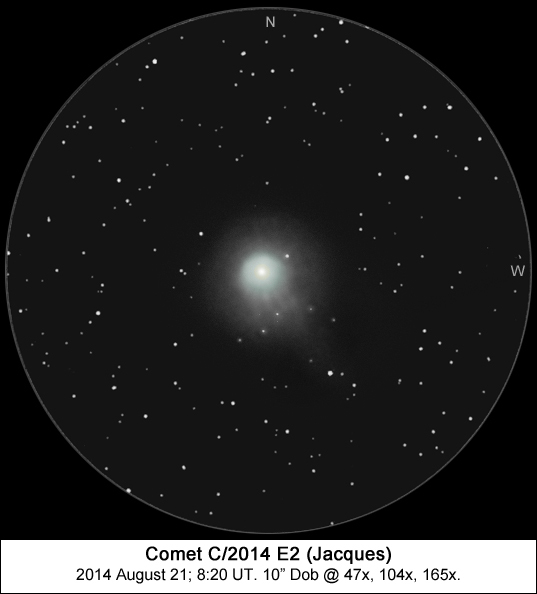 Comet C/2014 E2 (Jacques) was a constant companion during this year's OSP. 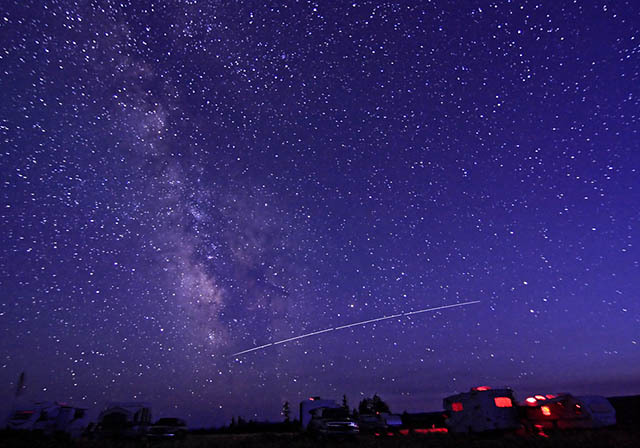 Passing through Cassiopeia, Jacques was a highlight for many observers in the field. It appeared as a bright comet with a very large coma. It was a threshold naked-eye object for me except on Sunday morning when it was more obvious. In any case, it was readily visible in binoculars. Jacques showed a bright inner coma, moderately condensed. The outer coma was huge and faded out very gradually to the edges. In the 10" Dob at 165x, I saw a faint stellar nucleus and a hint of parabolic hood structure. The coma appeared asymmetrical, with a subtle sweep back and elongation to the south. The inner coma appeared bluish, but did not respond to the Orion UltraBlock filter. At high power, the nucleus and immediate surroundings appeared yellowish. The comet's motion westward was obvious within a few minutes as the coma passed by a field star. Those high clouds didn't go away very quickly. I poked around a bit in the evening, but wasn't enthusiastic about trying to pull difficult objects out of the haze and creeping thicker clouds. I will say that Comet Jacques was nicely placed next to Eta Cassiopeia. I opted for sleep, and set my alarm for 2am. It wasn't easy to get up, but the sky was reasonably clear. Limiting magnitude in Pegasus was only 6.6, so there was still some stuff in the way. 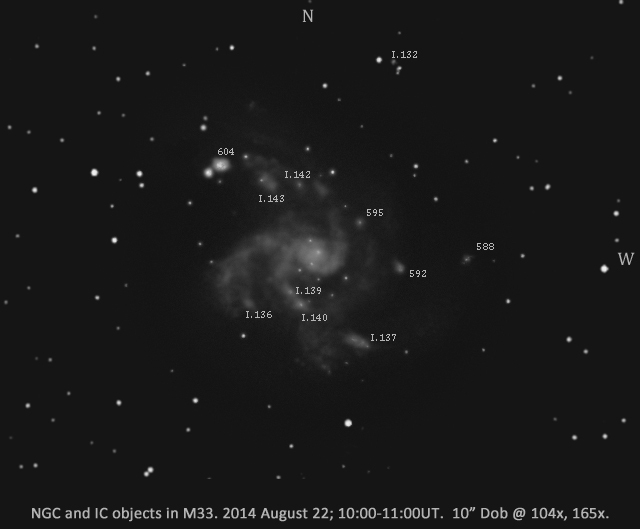 I chose this morning to tackle NGC and IC objects in M33. The big galaxy shows a wealth of detail, and not all of the condensations have an NGC or IC designation. I used the Bill Cone/Ray Gralak finder chart referenced in Steve Gottlieb's article. NGC 604: This one needs no introduction. A very bright, condensed oval knot in the spiral arm NE of the galaxy's core. At 104x, is brighter in center. At 208x, looks mottled with a couple of brighter points along the major axis that come and go with seeing. Elongated mainly E-W.
NGC 595: Diffuse knot that resembles a little elliptical galaxy to the N of the galaxy's core. In 2nd spiral arm out from core. At 165x, looks oval and slightly brighter in center. Maybe a bit of trailing nebulosity to the W.
NGC 592: Runner-up to NGC 604 as the most prominent knot in M33. Very condensed. Foreground star or clump of stars in its southern part. Bulk of object trails away to the N, lending a triangular appearance. At 165x, looks like a tightly-packed, unresolved open cluster with an irregular shape. NGC 588: Not as distinct visually as in photos. More diffuse than NGC 592 with a faint central condensation. Basically just a roundish hazy spot that is more prominent with averted vision. IC 143: Appears as a couple of hazy bright patches in the arm W of NGC 604, aligned with the arm and just W of a prominent field star. IC 142: Bright spot dominated by a stellar central condensation. At 165x looks like an evenly-illuminated, nonstellar spot. Very small and condensed. IC 136: Prominent irregular patch that looks like a protruding piece of spiral arm. Rather large. IC 139/140: At 104x, appears as one elongated mass. 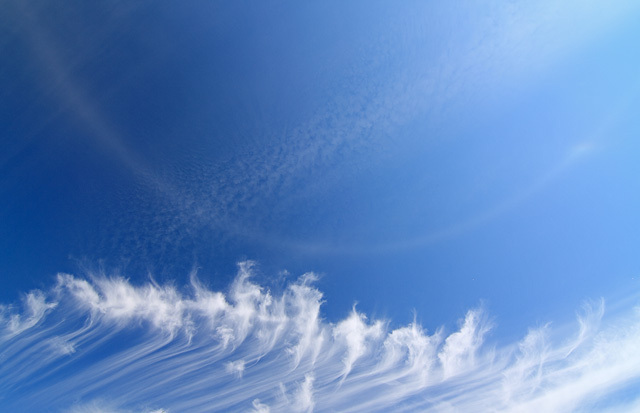 At 165x, 2 condensations are visible within a common halo. IC 139 portion to NNE looks like a nebulous cluster with several internal condensations. IC 140 is smaller with a bright stellar center surrounded by haze. IC 137: Very prominent, large region. Mottled and elongated NE-SW. Near end of a bright portion of a spiral arm. IC 132: Very small hazy spot at 104x. Larger hazy spot at 330x. Appears evenly illuminated. I managed to pull my only all-nighter of the star party, although I can't say it was the most productive observing night. Thunderstorms passed by to the north during the early evening, and some of the clouds kept passing over well into the night. One of the objects on the advanced observing list was the Snake Nebula, Barnard 72. I can't say that this dark nebula was showcased by the conditions at this year's OSP with haze around the horizons and Ophiuchus well past the meridian. Barnard 72: Snake shape rather difficult. Easy to see a couple of the darkest portions, one on the S edge and another on the W edge. Larger than size quoted in The Night Sky Observer's Guide. Probably about 30' long and a few arcminutes wide. There is a pinch in the SW portion. Sketched at 47x, but easier to see the snake form at 76x. Appears to be mostly bounded by dust and unresolved stars. At 76x, a lot of irregularity and mottling along the edges of the dark lane. Really subtle under these unspectacular conditions. Some of the other objects on my list were (I thought) beyond my limits with the 10" Dob. Others were only about halfway so. One of the observing challenges was to see 5 galaxies in the compact group Seyfert's Sextet. This object is easily visible as a lumpy mass, but I've never been able to pick out more than three of the individual members (and a couple of those fleetingly). The same was true Friday evening. All 5 galaxies in Stephan's Quintet were visible, but the list challenge was to also see the very faint companion NGC 7320C. That one is almost certainly beyond my 10", and frankly I've had better views of the Quintet from my yard. I took a break and looked through a couple of other scopes. It's odd that I go to a place where there are a bunch of big telescopes and spend very little time looking through any but my own, but really I feel the best way to experience and view astronomical objects is with detailed and patient study. You don't get this with a quick view and then stepping away to let someone else have a quick view. I typically spend anywhere between 30 and 45 minutes viewing and sketching a detailed object. Back at my Dob, I went after a longshot. IC 298 A and B are an interesting galaxy pair that look like a "1" and a "0" in photos. They are also very small and faint. With conditions about as good as they got at this year's party (limiting magnitude about 6.9 halfway up the sky), I took the easy starhop via 94 Ceti to a pair of stars in a sparse field. To the NW of the brighter star, I could sometimes see a ghostly round patch that must be the "0" of the IC 298 galaxy pair. This was visible about half the time with averted vision. A very faint threshold object that sometimes looked double was fleetingly visible closer to the star at 330x. This might have been the "1" galaxy, or a field star, or a combination. After that excursion, I went back to Comet Oukaimeden for a second helping. The comet looked much as it had the previous morning. I estimated its magnitude as 8.5. The big event of the morning was the triangle of the crescent moon, Jupiter and Venus. This night looked good except for a little haze encroaching from the NW. Unfortunately, the all-nighter had drained me and I didn't feel like revisiting M101 or doing much of anything, really. I visited a few globular clusters and showpiece objects and went to bed. I got up shortly after 1:00am to close things out. I didn't have any observing plans in mind, and the limiting magnitude was a solid but unspectacular 6.9. The seeing, as it was for most of the party, was merely average. So, I bounced around from object to object, enjoying my scope and the sky. Comet Jacques was a relatively easy naked-eye object this morning. 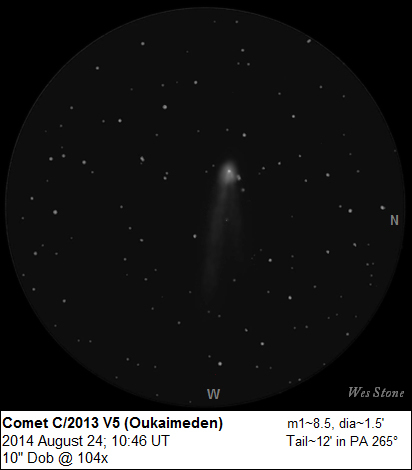 Comet Oukaimeden looked especially nice, with the tail stretching about 12' and showing two branches. Oukaimeden was also visible in my 10x42 binoculars, albeit merely as a slightly bloated star. While I was sketching Jacques, three things happened: 1) My telescope focuser stopped working (it's held together with toothpicks and does this fairly regularly); 2) my flashlight battery died (but I had started the night with fresh batteries); and 3) the focusing ring on my binoculars froze up (what the heck?). It was almost 2am and the moon would be coming up soon, so I called it a night. Thursday morning was marked by a lot of high clouds, but also a special treat: a complete parhelic circle extending around the sky at the same altitude as the sun. I always like sun halos, and this was one of the few times I have seen the whole circle. In addition, two parhelia (sundogs) and an upper tangent arc were visible. 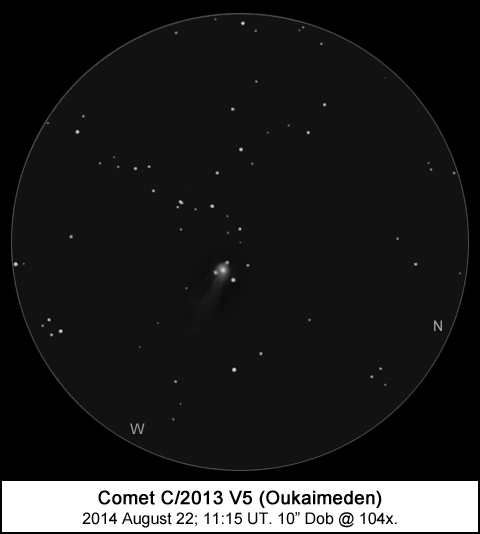 After that thorough examination of M33, I took my first look at Comet C/2013 V5 (Oukaimeden). Despite a rising crescent moon and poor transparency near the horizon, the comet was immediately visible after a starhop from open cluster NGC 2244 in Monoceros. The comet showed a very condensed coma buried in a triangle of field stars. There was a stellar central condensation and a bright inner coma. The coma was slightly wedge-shaped, opening to the W. Not much of an outer coma, but a fairly obvious tail about 7' in length pointing westward and broadening a bit as it faded out. The comet's eastward motion was visible within 10 minutes; within 15 minutes, the comet's center had exited the triangle of field stars. 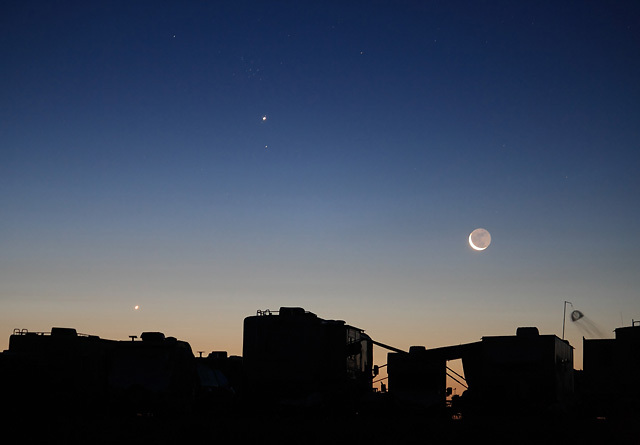 As twilight brightened, Venus joined Jupiter and the earthshine-bedecked moon for a nice predawn assembly.